This article is a short summary of Mario & Luigi: Paper Jam. Mario & Luigi: Paper Jam (named Mario & Luigi: Paper Jam Bros. in Europe and Australia) is a role-playing game for Nintendo 3DS which crosses the Paper Mario series into the Mario & Luigi series. Make room, Mario & Luigi... Paper Mario is joining in the fun! When Luigi™ opens a portal to Paper Mario's world, paper friends and foes alike leap off the page. Can you stop two Bowsers...rescue two princesses...and manage on Luigi? Triple the fun with 3 playable characters! Work together to grab, fly, and smash your way through the world. Unleash super-powerful 3-person attacks with the help of Paper Mario™. Crumple your enemies in giant cardboard clashes. Collect special in-game cards that can help you win battles and level up. Use amiibo figures to create fun and formidable character cards. Paper Mario™ is jumping off the page and into the quirky adventures of Mario™ and Luigi™! Become a superstar team of Mario Bros. to take on quests, take down enemies, and untangle these two classic universes in this playful new entry in the Mario and Luigi RPG series. 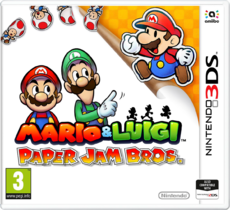 The Mario & Luigi: Paper Jam game is the newest entry in the wild and popular Mario and Luigi RPG series. The denizens of Paper Mario are spilling out of the pages of a mysterious book and making mischief in the Mushroom Kingdom. You'll call on the talents of Mario, Luigi, and Paper Mario to solve puzzles, track Toads, chase Nabbit, race Yoshi™, and more in a variety of quests to separate and save the two worlds. Looking for a change of pace?...er, temp? Challenge giant bosses using a combo of rhythm-based micro-games and an equally giant papercraft. While looking for the source of a drought in the attic of Princess Peach's castle, Luigi accidentally knocks over a book containing the world of Paper Mario, causing Paper Mario-style characters to appear. However, Bowser eventually meets up with his paper self, and the two decide to team up to kidnap the two versions of Peach. Mario and Luigi must now team up with Paper Mario to defeat both Bowsers and return the paper characters to their proper world. While the game is a crossover; gameplay generally lends itself more toward the Mario & Luigi style of gameplay; in addition to Mario and Luigi, who still use the same button inputs to control, players also control Paper Mario using the Y button. The Mario & Luigi battle system is also used; all three characters can attack by jumping and with a hammer, though Paper Mario is given a special ability: Copy, which allows several Paper Marios to appear alongside the original, increasing his attack power and defense. In addition, while Bros. Attacks also return, one of Paper Mario's abilities also allows all three to perform a Trio Attack. At some points in the game, the player partakes in a papercraft battle, in which the player takes control of "Papercraft Mario", a giant paper sculpture of Mario, and must use it to defeat several papercraft enemies or bosses. This game is also confirmed to be receiving amiibo support. The game is only compatible with the amiibo of Mario characters, and scanning them unlocks special Battle Cards. ↑ Mario & Luigi: Paper Jam on the official Japanese amiibo website. Retrieved October 1, 2015. ↑ Mario & Luigi: Paper Jam Bros. Release Date Announced. IGN (October 15, 2015). Retrieved October 15, 2015. ↑ Paper Jam Bros Float To Europe, Australia In December. Nintendo World Report (October 15, 2015). Retrieved October 15, 2015. ↑ Amiibo support confirmed for Mario & Luigi: Paper Jam. amiibo News (October 1, 2015). Retrieved October 1, 2015. This page was last edited on 11 September 2016, at 22:22.